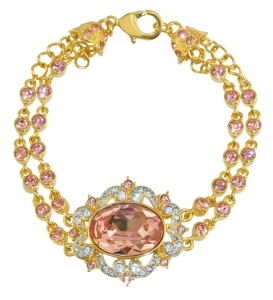 Inspired by a brooch with a central oval pink topaz with a scroll broder of cushion-shaped diamonds suspending a detable topaz and diamond drop mounted in silver and gold and mad ein about 1860. This was purchase by HRH The Princess of Wales, later Queen Mary, in 1901. This brooch passed to Princess Margaret and was sold at auction in 2006. This brooch is inspired from a necklace worn by Princess Diana on many occassions with either an emerald or sapphire drop. In 1870, Queen Victoria, finding the Imperial State Crown too heavy, commissioned this small, Tudor style crown to be made, using diamonds from her personal collection.